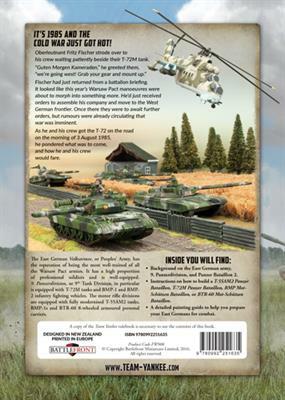 Volksarmee, East Germans in World War III is a 32-page hardback book that tells the story of Oberleutnant Fritz Fischer’s battalion of T-72M tanks and their attack on Northern Germany against the West German Defenders. 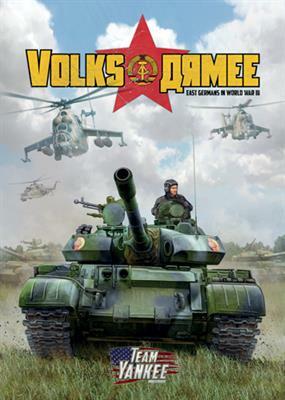 Volksarmee provides players with Army lists for a T-55 AM2 Panzer Bataillon, T-72M Panzer Bataillon, BMP Mot-Schützen Bataillon, and BTR-60 Mot-Schützen Bataillon, as well as card pack, contain 17 unit cards, history of the East German Army leading into the Cold War, painting guides and scenarios for the Team Yankee game. 32 Page colour hardback book.